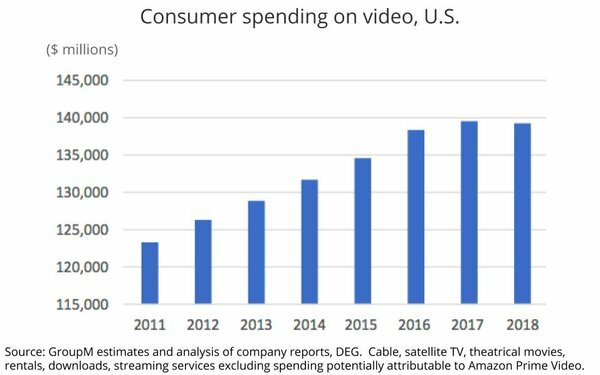 The $140 billion-plus video programming marketplace, including TV, will increasingly adopt hybrid business models, but the impact on ad-supported options will remain gradual, according to a new market assessment published by GroupM this morning. The GroupM “POV” on streaming services, the first to be published by former Wall Street analyst since joining GroupM as global president of business intelligence, is consistent with Wieser’s long-held position that TV and/or the expanded ad-supported video marketplace, will remain Madison Avenue’s apex medium. Wieser also predicts conventional TV programmers will continue to “offer less clutter and more of an opportunity to break through” and enhanced targeting opportunities will help preserve TV’s dominance in the ad mix.